A suicide attack by a teenage boy after early morning prayers at a Mosque has claimed the lives of at least 30 persons in Mubi, Adamawa State. According to the Adamawa State Police Command, the suicide attack occurred around 5:20am local time, at Kunu Araha, a suburb in Mubi North. It was allegedly triggered by a yet to be identified teenage boy who set off the suicide vest he was wearing. Adamawa police spokesman, Othman Abubakar, who confirmed the incident, said more than 30 persons lost their lives in the dawn Mosque attack. 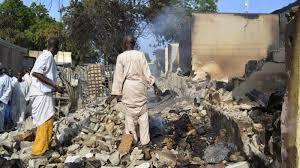 “We were made to understand that there was a bomb blast at a mosque in Mubi and over 30 lives were lost. A boy about 17-year-old wearing a suicide vest entered the mosque along with other worshippers. Immediately after the prayers, he detonated the bomb. Many of the wounded are receiving treatment at various hospitals in Mubi North where the attacks occurred around Kunu Araha area” he said. He noted that several other persons wounded in the attacks are receiving medical attention at various medical hospitals in Mubi Town. However, emergency aid workers and other first responders put the death toll in the attack at 40. An official working with the International Rescue Committee, Emma Adasolid, among the first responders at the scene said about 40 dead bodies were evacuated.